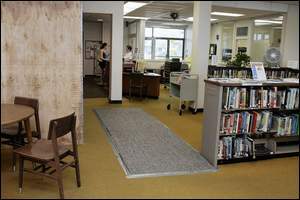 The Red Bank Public Library has patched carpeting leading to the front desk while it is being renovated. Librarian assistant Joan Kiernan helps Nicolisa Cohen (left) of Long Branch with information Thursday, as the library remains open during this stage of the project. $1.2 million from the borough. A $200,000 bequest from a former assistant librarian. A mix of federal grants, private donations and fundraising. RED BANK — The sign taped to the front door of the borough library apologized for the public computers being off, but patron Roxanne Lewis said she understood, even though she came to use them. "It's understandable. I've been coming here for years, and I know it's a temporary inconvenience," said Lewis, who sat at a table reading a magazine in the sticky summer heat. "Air conditioning would be a top priority." The old central air conditioning unit broke down, which means it's too hot to run the library's public computers. Nearby, an electrician worked on a panel of circuit breakers. After 40 years, the borough library is being renovated, and work being done through the $1.6 million project will take care of problems such as the lack of air conditioning, handicapped access to the second floor and barrier-free restrooms. The project also will open additional space on the second floor to the public. Library patron Steve Buczny of Red Bank said he has no complaints about the library but agreed work is needed on the building. "I heard they're putting an elevator in and the bathrooms would be more accessible for the handicapped," he said. "Air conditioning would be nice." Library officials said they'll do their best to keep the library open during its makeover, but some work with jackhammers and saws will force it to close for a few days in mid-July. "At this point, they're going to be working on the second floor, which isn't open to the public and won't cause much disruption," said Deborah Griffin-Sadel, library director. "In a couple of weeks, they'll cut the openings for the elevator shaft, and that will close the building for a couple of days." After tearing down some walls on the second floor, workers from Santorini Construction of Neptune will refinish the floors and install air conditioning and heating systems, which will allow that space to be used for some of the library's collection and for art displays. "Once the noisy stuff is done, we'll be open," she said. Much of the library's older collection went into storage except for the most popular and newest adult and children's books and video and audio items, which will be located on the main floor, Griffin-Sadel said. Borough library patrons also can use their library cards to borrow materials from the Libraries of Middlesex Automation Consortium's 28 member libraries, which include the Long Branch and Matawan-Aberdeen libraries. Summer reading programs will continue, but library officials have avoided scheduling formal programs in case they would have to be called off because of construction, she said. The borough of Red Bank is funding $1.2 million of the project, which also is financed by a $40,000 state grant and a mix of federal grants, private donations and fundraising. The library also has a $200,000 gift from the estate of Avice M. Noblett, a former assistant librarian, to make over the children's room, which will be renamed for her, Griffin-Sadel said. The children's room — a library addition that was built in 1968 and still has some of the original 1960s vintage furniture — will be arranged into four separate areas for "big and little kids," Griffin-Sadel said. There also will be an area with seating so parents and children can read together, and it will better accommodate disabled patrons. Now, a patron in a wheelchair might have difficulty accessing stacks of books, she said. The room will get new furniture and shelving, and a harvest gold carpet will be replaced. More space also will be provided for public computers and parking, Griffin-Sadel said. "It's a gorgeous room with wood paneling and a fireplace," Griffin-Sadel said. "Now people will have access to one of the most beautiful rooms in Red Bank." Griffin-Sadel said work is expected to be completed by early 2007. Work on the library is one of the last requirements the borough must fulfill for an October 2002 settlement with the U.S. Department of Justice that required it bring public facilities in compliance with the Americans with Disabilities Act. That act requires public buildings to be barrier-free and accessible to all citizens.